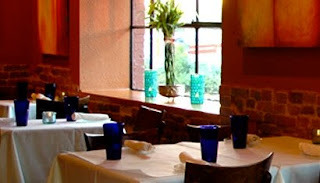 Buckhead Betty ... on a Budget: How About Some Food with Your Tapas? How About Some Food with Your Tapas? Tapas. One of the hottest little restaurant themes to hit major cities everywhere over the past 10 years, but sadly, definitely not one that is typically great for a budget. It's even harder because tapas restaurants seem to be favored for birthdays and special events, so put 20 people at a table, order 50 dishes, and just TRY to have the waiter do separate checks. HA. I was surprised recently though with one of our local tapas joints. I was lucky to be taken to Pura Vida, and they WOWed me with their creative menu, pricing, and fun drinks. The atmosphere was perfect for a smaller gals night out, or a cute little date night with your significant other - very quaint and tucked away off of N. Highland. The best surprise though, was that this place would be fabulously perfect for a budget night out! We first ordered drinks - hello, Bloody Maria! Made with tequila, this drink has an extra kick with this hot pepper paste they add in. Better yet, it was only about $5 for a huge glass. Next up, a variety of tapas including duck confit with plantains, a pizza with hearts of palm and arugula, a chicken burrito with tomatillo sauce, and goat (weird, I know, but so good) with smashed green bananas. The waiter even threw in a bonus: mushrooms in chipotle butter. For the prices, I was expecting similarly small plates like many of the other tapas places around (thus why we ordered so many haha), but I was SO surprised when each dish came out and was almost the size of a full appetizer! The duck confit or burrito easily could have been my entire meal, and none of the dishes were more than $6 to $9. We feasted until we couldn't eat another bite. It makes me hungry just thinking about it now. If you are in the mood for somewhere fun to venture out to this weekend, I highly recommend Pura Vita. It's definitely on my list of new local favorites, and I can't wait to get back there again soon. Their executive chef was also a contestant on "Top Chef". It is a great place. Thanks for the tip! Totally agree with you on overpriced tapas! Wow Jos, I had no idea! He definitely put together a great menu at Pura Vida, I loved it. Interesting to hear women complain about tapas. I've ALWAYS complained about tapas. Its pointless, expensive and to me the equivalent of a high school prom, just ladies showing off who's outfit is better while drinking and being catty. And sharing? No way. I didn't order the one (probably expensive) dish that has some chance of substantial protein because I want you to try it. I'm hungry so back off. Down with all tapas. Sorry, Spain.